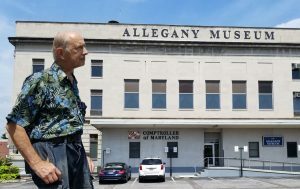 Rolfe Singerman, long term volunteer for the Allegany Museum, recently sponsored a new an eye-catching sign for Allegany Museum. 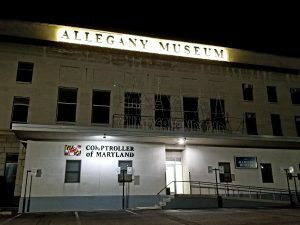 The sign, which is illuminated at night, can be seen atop the Museum building. It faces the Museum carpark and is easily read by traffic passing on the I68. The planned Grand Entrance for the Museum will be on that side of the building, and will lead into the new Crossroads of America exhibition space which will occupy most of the first floor. Lisa Dall’olio Grove and Dall’olio Architects are designing the new entrance. Museum Vice President, Joe Weaver, says that the installation of the sign has raised awareness of the Museum, and increased visitation. Gary Bartik, Museum President, and Don Fischer sized and scaled the letters, and Fischer Signs and Maryland Electric installed the sign. Jeff Rhodes, Brooke Castle, and Rick Shade of the City of Cumberland assisted in removing the old sign. The project is an example of individuals, cultural entities, and government working together to enhance our city.